(From the foreword by Kris Saknussemm) As with all the poets I most admire, words are living things for Tikuli. But as you will come to discover, they are never deployed for their own sake. She uses them to tell stories. The images, scenes, characters and fragments of visionary empathy that you will find in this book are all rooted in her native India-and yet they reach out far beyond national and cultural boundaries. They do so because they have an interior cohesion of spirit. Her subjects are often the dispossessed, the lost…the abused. There are undercurrents of sorrow and anger. And yet love shines through, even when it seems to be fading away. Above all, there’s a powerful sense of hope at work-a conviction in the redemptive strength of poetry. By now, you must be aware about my love for poetry. I might miss a novel, but I never leave a chance to read the poetry. When I came across this book, I was interested in it by the cover of the book (it’s so pretty!) and the title. Anybody who can write about chaos deserves a chance as per me. So, I sat with this book, moving its virtual pages, visiting the stark reality of the emotions poet has captured in those pages. The first thing that stood out for me was that none of the poem in the book has titles. It feels as if the poet didn’t want to burden these poems with the few titles. For me, it worked as it kept the mystery of the coming poem intact. The subject: These poems talk about the themes like child abuse, those mad women seen on the street, war victims, a mob-stoned woman etc. It’s not easy to do justice to such subjects especially in poetry, but those poem don’t hesitate in expressing themselves. Raw Emotions: The poetry captures the rawness of the emotions quite well. It pulled me into the verses and made me see those scenes through the poet’s eyes. and raises it to his lips. sparks of love into the air? Repetition of ideas: This is a very common problem when we’re working on short poetry. The book has many poems on silence and conversations. I agree with the poet on these two being the most versatile subjects, meaning that both these things can mean so much, yet nothing; but after three-four poems, it started feeling repetitive to me. Abrupt Last Line: Poetry is such a subjective thing. Each person sees different things in poems. To me, the poems felt ending abruptly. As in they started very nicely, weaving up the emotions, lining up the scene, and then out of blue, they’ll end. Last but not the least: I feel the price of the book is too high. Although I got a complementary soft copy, I don’t think people are ready to spend somewhere around Rs 1000 for poetry. of her short stories and poems have appeared in print and in online journals and literary magazines including Le Zaparougue, MiCROW 8, Troubadour21, The Smoking Book (Poets Wear Prada Press, US), The Enchanting Verses Literary Review, Mnemosyne Literary Journal, Women’s Web. Some of her print publications include poems in Guntur National Poetry Festival Anthology and much acclaimed Chicken Soup For The Indian Romantic Soul(Westland). Her work has also been featured on websites related to gender issues and child sexual abuse. Where Even the Present is Ancient: Benaras is a book that seeks to tell the little stories that make us who we are. The author believes that Benaras resides in all of us Indians, in some beautiful often-unknown way. The author is the Sutradhar, in that she attempts to connect an India that many do not realize exists, in that it is everybody’s story. Radha, Krishna, Ganga, Benaras and Me are all characters in this deluge of poems. This attempt at telling the story of the ancient, of love and of faith is to instil the confidence that poetry exists in all of us, everywhere, all that is needed is to smell its fragrance. To those outside India, the book does not seek to be a representation of what India is or was, but a whiff of what it also can be. It is an attempt to ask people to see the little stories that govern all of our lives, stories that we often don’t see, but those that are important. The audience for this book might be strewn across the globe, for faith is not religion-centric, it is people- centric and often without dimensions. In poetry there is no beginning, no middle, nor no end. Like faith it is everywhere, it is omnipresent. The book affords no answers, nor no questions, but if you listen and read carefully you will see new things, a new beauty perhaps, one that has been silent so long. I am a Hindu, but then there are many things which make me question the traditions we follow. The poet, at times, seem to be similarly perplexed by those rituals (or maybe it was just my interpretation of the words fueled by my own confusion.) while at other moments, she was completely satisfied to bow to these rituals. Like in poem ‘To Vishvanath’, these simple four lines capture the crowd vying for entering a temple. I haven’t been to Kashi Vishvanath temple (or Benaras), but then this crowd is one of the reasons I haven’t. The poet has traveled and captured Benaras at all moments, 1:30 a.m., 3:00 a.m.,5:00 a.m. She has captured myriads of emotions as well: death, religion, love, heartbreak, poverty, contentment; all of them beaded with the thread of Ganga. I loved that author hasn’t shied away from the reality of the place. She hasn’t tried to glamorize the place or show only the positive points. She has shown the place as she saw it– sometimes a solace, sometimes a pain. The poems have descriptions in the end to explain the meaning of Hindi words used. Although the meanings indicated are correct, I don’t think they are sufficient for somebody who doesn’t know anything about these rituals/customs/traditions to understand the poem. Since I’m aware about all these things, I could get what exactly the poet is saying, but not everybody will get all the poems. 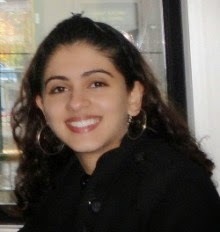 Maitreyee B Chowdhury is a web columnist and creative writer. She is author of Reflections on My India, a book of Indian traditions and spirituality in parts. Maitreyee is also author of Uttam Kumar and Suchitra Sen- Bengali Cinema’s First Couple and Ichhe Holo Tai, a bilingual muti media presentation of poetry. 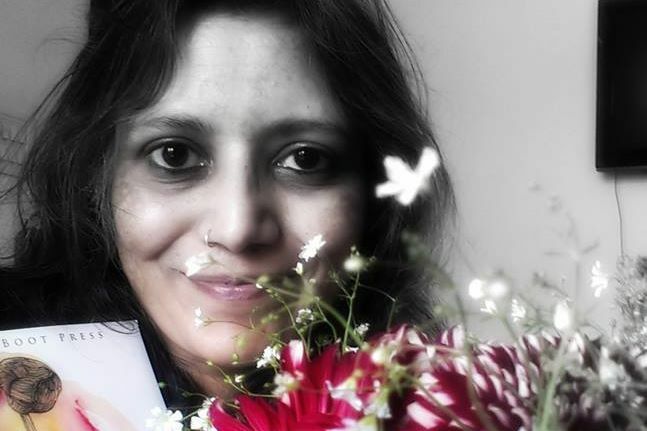 Maitreyee is featured amongst other Indian writers such as Gulzar, Shashi Tharoor and Deepti Naval in an anthology of Indian writers Celebrating India. A disclaimer: This book is a part of a blog tour conducted by The Book Club and all the reviews are done in exchange of a copy of the book from the publisher or author. No monetary trasaction takes place. 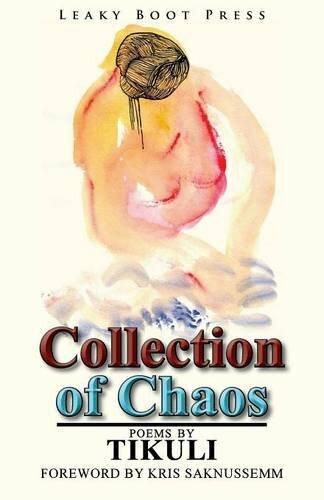 The book is a collection of free verse poems that encapsulate the poet’s most heartfelt emotions about life. They speak of moments that sweep our breath away, of beauty that bewitches the heart, of people, memories, sights, sounds and smells that awaken a sense of wonder and wistfulness. 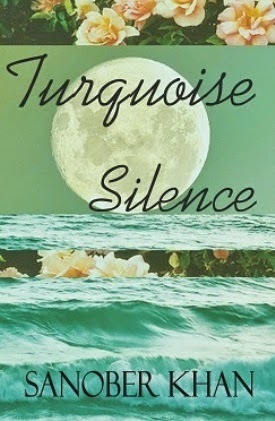 With rich metaphors and eloquently flowing imagery, the poet’s love for the simple things in life unfolds in different moods and tones, ultimately ending up in words felt, cherished, concieved and written… in turquoise silence. Although writing poetry is an art achieved by a lot of practice, poetry for me is foray into the emotions. This book helped me delve into the lines and moments of poet’s life. The book starts with a poem called “Poetry In My Heart”. There was nothing in the book I didn’t like, although I wish for more variety. I love the freedom of free verse, but then I also enjoy the restricted rhythm of the form poetry which was missing. But it’s not the shortcoming of the book; it’s more like my thirst to read more of the poems. Like most of the poetry, the book left me with the feeling of humbleness and gratitude. It touched me like an old friend, and few of the lines (like those mentioned above) decided to stay with me forever. In short, I loved it. Writing poetry is a very different, mystical experience. There is no plot, no storyline, no characters…just a stage set for you and your own deepest self. When I wrote my first poem six years ago, I never imagined it would someday become such an important aspect of my life. I have always loved poetry for the creative freedom it offers, the minimal rules, its ability to elevate even the most ordinary moments. At the end of each poem I write, it feels as though I have not just evolved in my style, but also as a person. My work first appeared in Cyberwit’s international journal, the Taj Mahal Review, which paved the way for me to getting two books published. I have long been inspired by poets like Khalil Gibran, Rumi, Rabindranath Tagore ,Rolf Jacobsen, E.E Cummings, and John Keats. A voracious reader myself, I enjoy reading poetry and novels from around the globe.